A spectacular new image of an unusual spiral galaxy in the Coma Galaxy Cluster has been created from data taken by the Advanced Camera for Surveys on the NASA/ESA Hubble Space Telescope. 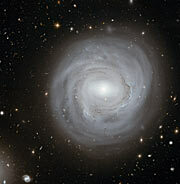 It reveals fine details of the galaxy, NGC 4921, as well as an extraordinary rich background of more remote galaxies stretching back to the early Universe. 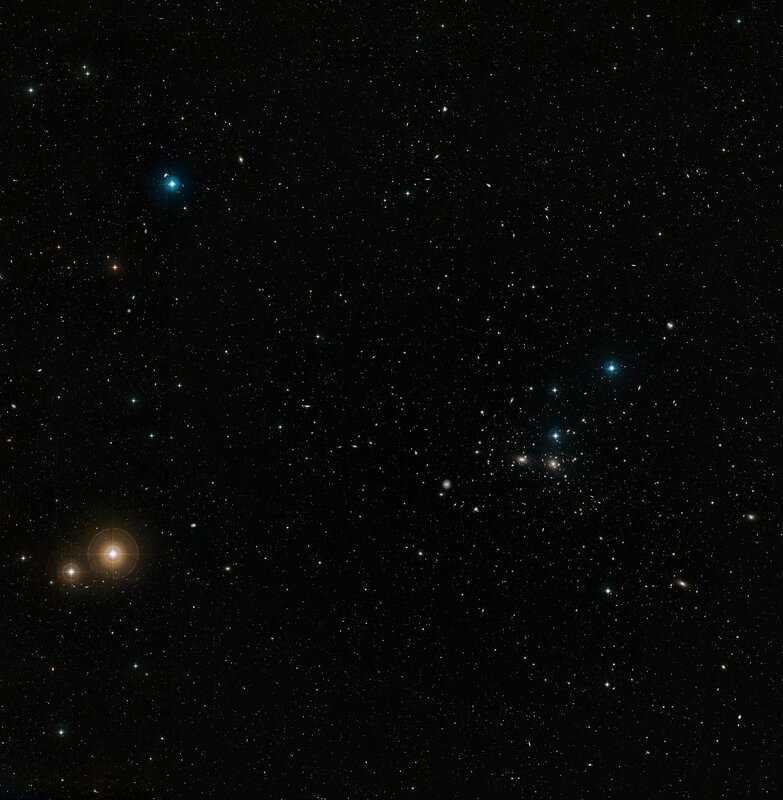 The Coma Galaxy Cluster, in the northern constellation of Coma Berenices, the hair of Queen Berenice, is one of the closest very rich collections of galaxies in the nearby Universe. 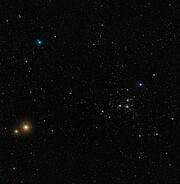 The cluster, also known as Abell 1656, is about 320 million light-years from Earth and contains more than 1000 members. 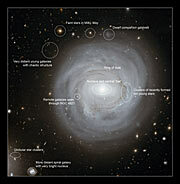 The brightest galaxies, including NGC 4921 shown here, were discovered back in the late 18th century by William Herschel. 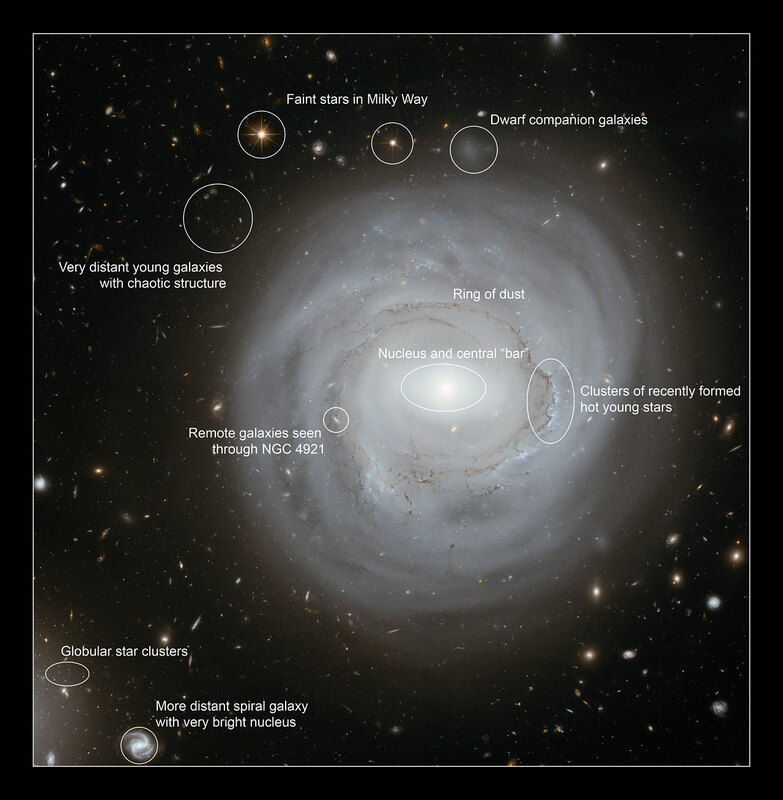 The galaxies in rich clusters undergo many interactions and mergers that tend to gradually turn gas-rich spirals into elliptical systems without much active star formation. As a result there are far more ellipticals and fewer spirals in the Coma Cluster than are found in quieter corners of the Universe. NGC 4921 is one of the rare spirals in Coma, and a rather unusual one — it is an example of an "anaemic spiral" where the normal vigorous star formation that creates a spiral galaxy’s familiar bright arms is much less intense. As a result there is just a delicate swirl of dust in a ring around the galaxy, accompanied by some bright young blue stars that are clearly separated out by Hubble’s sharp vision. Much of the pale spiral structure in the outer parts of the galaxy is unusually smooth and gives the whole galaxy the ghostly look of a vast translucent jellyfish. 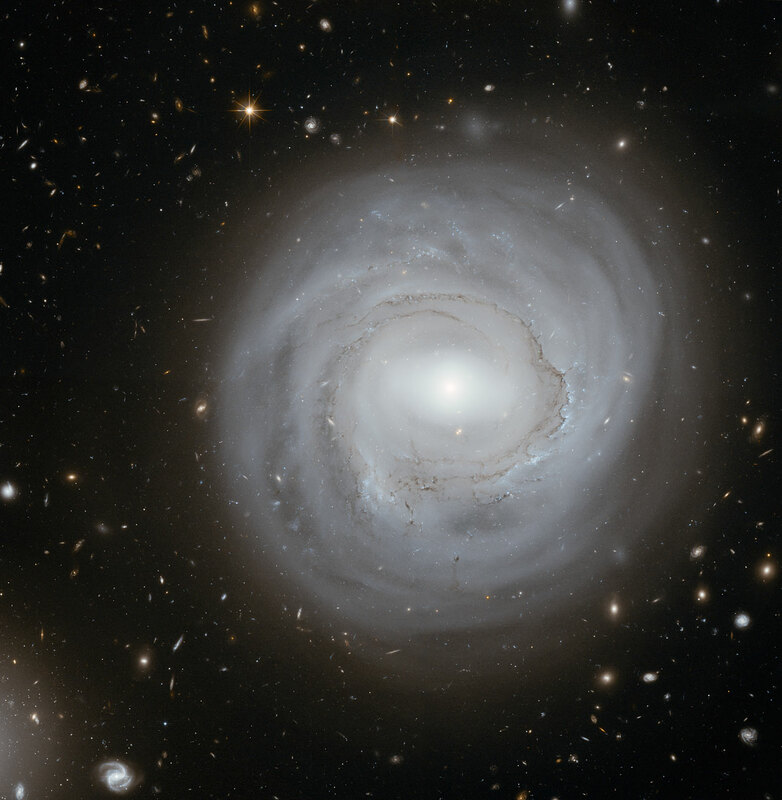 The long exposure times and sharp vision of Hubble also allowed it to not just image NGC 4921 in exquisite detail but also to see far beyond into the distant Universe. All around, and even through the galaxy itself, thousands of much more remote galaxies of all shapes, sizes and colours are visible. Many have the spotty and ragged appearance of galaxies at a time before the familiar division into spirals and ellipticals had become established. The Hubble images used to make this picture were originally obtained by a team led by Kem Cook (Lawrence Livermore National Laboratory, California). 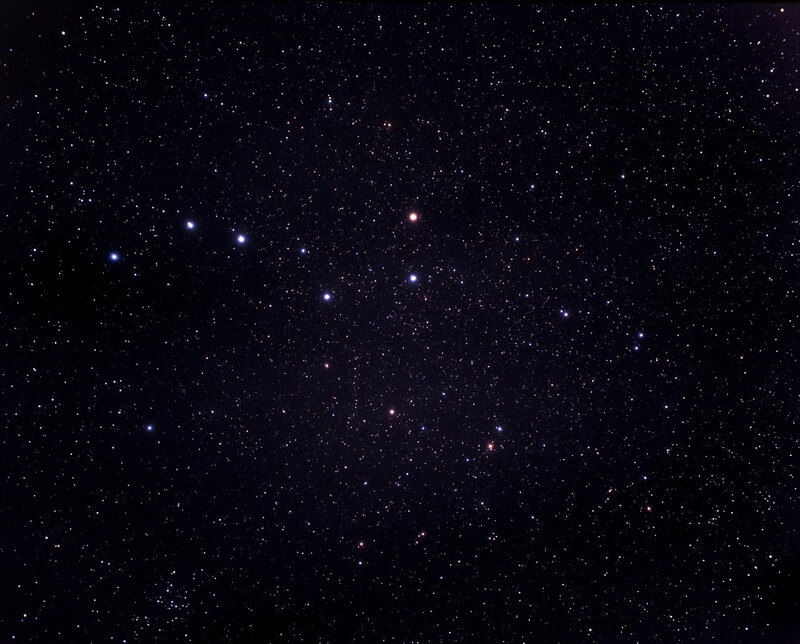 The team was using Hubble to search for Cepheid variable stars in NGC 4921 that could be used to measure the distance to the Coma Cluster and hence the expansion rate of the Universe. Unfortunately the failure of the Advanced Camera for Surveys in early 2007 meant that they had insufficient data to complete their original programme, although they hope to continue after the servicing mission. Very deep imaging data like this, which is available to anyone from the Hubble archives, may also be used for other interesting scientific explorations of this galaxy and its surroundings. This image was created from 50 separate exposures through a yellow filter and another 30 exposures through a near-infrared filter using the Wide Field Channel of the Advanced Camera for Surveys on Hubble. The total exposure times were approximately seventeen hours and ten hours respectively.